On April 21, 2016 the new addition was officially opened with a celebration event at the Continuing Studies Building. The new facility includes executive classrooms and language labs, as well as study, pronunciation and writing centres. An addition to the Continuing Studies building was approved as a university capital project by the Board of Governors. It provides expanded space for the English Language Centre's Pathways Program for international students. The project increased the size of the current building, which was opened in 2003, by approximately 72%. A program of requirements, which outlines the building spaces, uses and services was completed followed by preparation of the schematic design and arrangements for community consultation. A drop-in open house was held from 3:00 - 7:00 pm in the Student Union Building, Michele Pujol Room, on Tuesday, October 8th. The purpose of the event was to present information and answer questions regarding the project and the development approval process for the addition. To view the informational boards from the open house, click here. An engagement approach, primarily in the inform category was determined for this project, based on the nature of the project relative to the criteria listed and a review of the likely impacts. It included consultation activities given the need for the project to obtain a Development Variance Permit approval from the District of Saanich. A the building height variance was required as the project will be attached to the current Continuing Studies building, which at 14.8 metres, exceeded the Zoning Bylaw building height maximum limit of 10 metres. As the Bylaw required that the project provide one new parking stall for each additional 50m2 of new building space, a variance from this regulation was also required. The engagement approach provided key information to stakeholders and interested parties on and off campus and to accommodate input and feedback that assisted in advancing the project to design completion, final development approval and construction in 2014. A Development Variance Permit application was submitted to the District of Saanich on October 28, 2013. 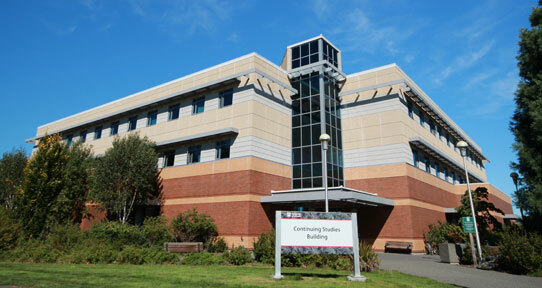 The District of Saanich zoning bylaw requires that a development variance permit be obtained for campus building projects that exceed 10 metres in height. Although the addition is 13m, with a lower level and two levels above grade, it is lower than the current three storey building height of 14.8m which was approved as part of the construction of the Continuing Studies Building in 2002. The design of the addition complements the size, massing and exterior treatment of the existing building. As no new parking spaces was proposed for the project, a variance of 63 spaces was also part of the university's application. Parking demand related to the building addition was anticipated to be minimal given the use of the majority of the new space for the English Language Centre and by international students. Parking spaces are also available in close proximity to the building and the project provided new bike parking spaces and is close to the campus transit exchange and the bike centre. The project is consistent with the university's ongoing efforts to reduce single occupance vehicle traffic and congestion and to encourage increased transit ridership, cycling and walking for travel to and from the campus. A presentation on the project was provided to the Saanich Advisory Design Panel on January 22, 2014. It is available here. The Panel, in its meeting minutes, indicated their support for the design. "It was the consensus of the members present that it be recommended that the design of the addition of the Continuing Studies Building at the University of Victoria, 3800 Finnerty Road, be accepted." The Development Variance Permit for the project was approved by Saanich Council on May 5, 2014. A copy of the university's presentation at the Council meeting is available here. An information session on the construction plans for the Building Addition was held May 21 at the Administrative Services Building. A copy of the notice is available here. The building addition was completed in 2016.